I can add a brass hook to any shuttle. The brass is laminated into the shell when it is glued up, then shaped. In this picture I've included a #14 crochet hook so that you can compare the size. I can also add a brass spike to any shuttle. The brass is laminated into the shell just like the brass hook, only the shaping is different. You might select a brass spike if you like a thinner or a sturdier spike, or if you select a relatively soft wood like Lacewood. Shell Styles: I make shuttle shells in two shell styles: traditional all wood, and adjustable pewter. The Pewter Shuttle has a layer of pewter substituted for the middle layer of veneer in the bottom shell. The pewter is exposed for the last half inch of each tip. The pewter bends very easily and doesn't spring back much. The end result is that the tips become easily adjustable. In fact, passing some thread through the tips will automatically open the tips to just barely click on the thread. I am using a modern safe lead free pewter. It is 91% Tin, 7% Antimony and 2% copper. I tested for color transfer by trying to "write" on paper with bare pewter and didn't see any color deposited on the paper, although I pressed hard enough to dent the paper. Since the pewter is easily and repeatedly adjustable (as long as you don't make huge bends) you can open the tips to make winding on easier. You can adjust the tips just past where they click if you need to tat silently. You can use the same shuttle for the heaviest to finest threads and you can adjust the tips where they will not damage delicate thread. Adding pewter is an option for 2, 2-1/2, 2-3/4, 3 and 3-3/8 inch shuttles in any point style. It is not available with the 2-1/4 inch shuttle as that is a special case and the pewter would not look right with an oil finish. To close a tip, hold the shuttle with both thumbs on the tip you want to close. Place both index fingers under the top shell to avoid stressing the shell/post joint. Place both middle and ring fingers under the bottom shell. Place both little fingers on top of both shells to keep the shuttle from rotating in your hands. Press with your thumbs to adjust the tip and the wood tip and pewter tip will bend. 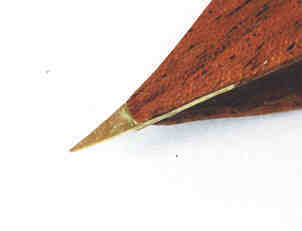 When you release pressure the wood tip will spring back more than the pewter tip, closing or partially closing the tip. 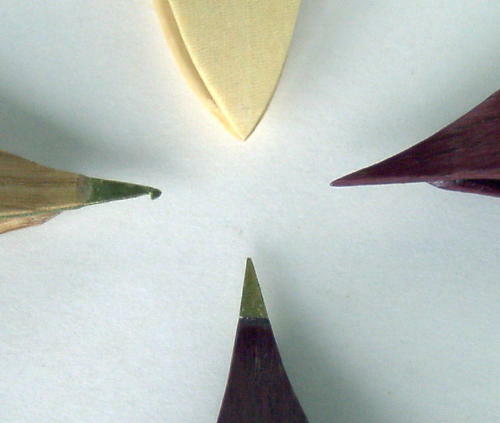 To open the tips just turn the shuttle over in your hand and press on the wooden tip. 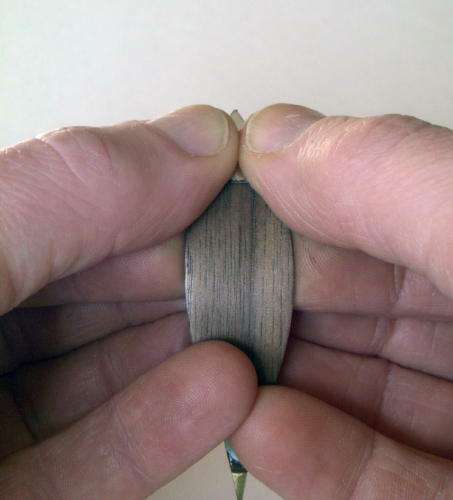 Hand position to close tip.